Nose HS has been continuously working on improving its quality of education in international understanding, environmental awareness, welfare, and community communication. All of our courses are based around our system of combined junior/senior high school education, working alongside local municipal elementary, junior high and high schools. 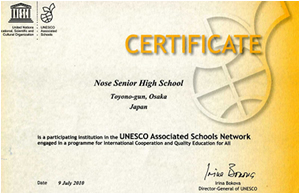 Our effort has been greatly appreciated and we are honoured to have been recognised as the seventh UNESCO Associated School within Osaka Prefecture. The UNESCO Associated Schools are the institutions from which MEXT has chosen to run and promote its programme “Education for Sustainable Development.